There is a remarkable group of individuals that operate each month without receiving nearly the amount of attention that they deserve. These wonderful individuals are our Adopt-A-Stream (AAS) monitors. They fight the elements every month to collect all kinds of water quality data in order to help us keep an eye on our rivers as a part of our Watershed Watch program. 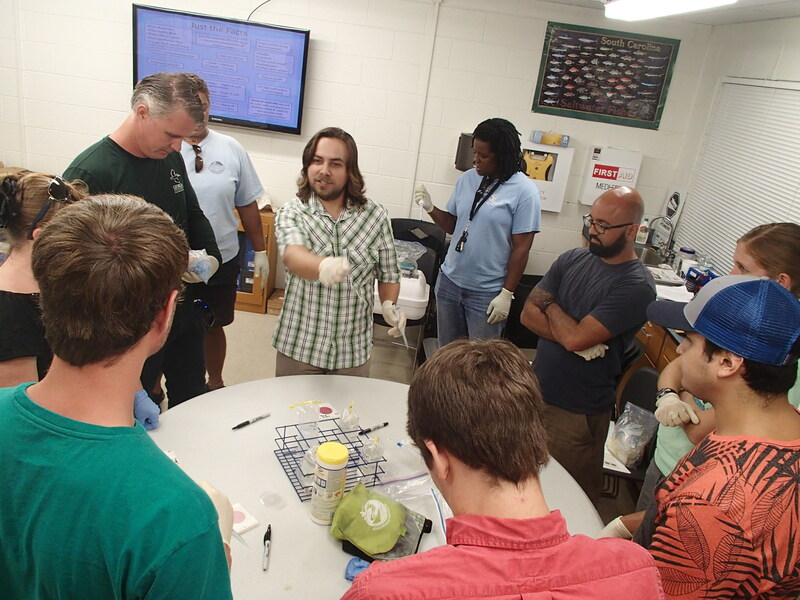 In order to shine more light on their incredibly valuable work, we are proud to begin a semi-annual review of water quality data while also highlighting the incredible volunteers that help us collect that data. Welcome to River Recap. You can check out the exact water quality data from any monitoring site by visiting the Georgia Adopt-A-Stream website. Here, we’ll take a look at recent trends and discuss the importance of each measure. Temperature: Over this last winter, average temperatures were quite a bit higher throughout our river basin. While this lead to some very pleasant outdoor weather in winter months, large temperature changes can have a significant impact on our waterways. Aquatic organisms adapt to narrow temperature ranges and water temperature can impact nearly all life functions such as respiration, metabolism, feeding, and development. Temperature is also intimately bound to dissolved oxygen. Dissolved Oxygen: All aquatic life (other than the plants) depend on oxygen in the water to respire. Oxygen levels can be impacted by nutrient loading as well as whether or not the waterway has any turbulent mixing (like rapids). Additionally, dissolved oxygen levels have an inverse relationship to temperatures. So when one goes up, the other goes down. This brings us back to our uncharacteristically warm winter. Average dissolved oxygen readings in specific regions were typically 15-25% lower than the previous two winters. While this drop could be created by nutrient loading (fertilizer running off into waterways), it seems more likely that temperature is the main culprit since the drop applies to our entire river basin. 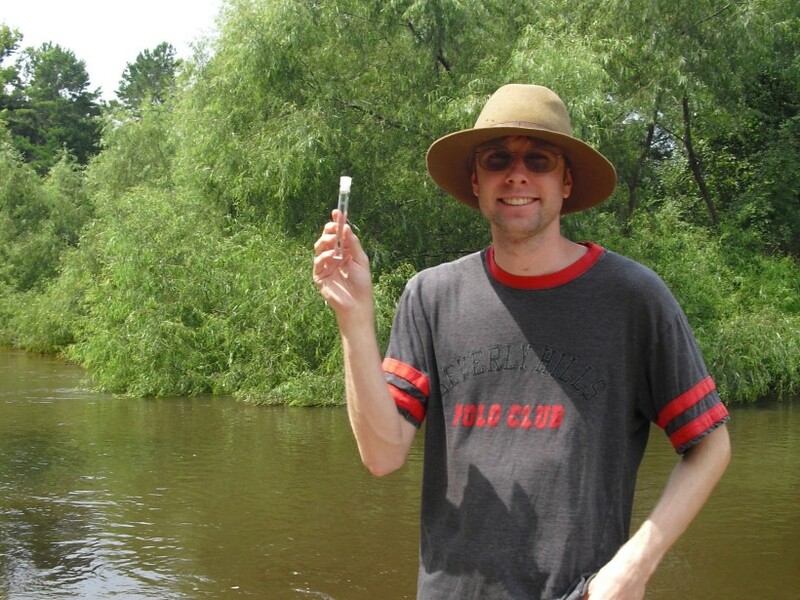 It’s important to remember how scarce dissolved oxygen truly is. Although you can’t truly compare gas concentrations to liquid concentrations, we’ll take a general look to visualize some fundamental differences. Our atmosphere is made up of around 21% oxygen. As a result, you and I breath somewhere around 210,000 ppm (parts per million) oxygen. To put that in comparison with aquatic systems, oxygen-rich waterways will contain around 10 ppm oxygen and averages across GA are around 5 ppm. We humans use only 1-2% of our daily energy pulling in oxygen. Fish on the other hand must use around 15% of their daily energy in order to respire. Their gills must also be a lot more efficient at trapping oxygen than our lungs. 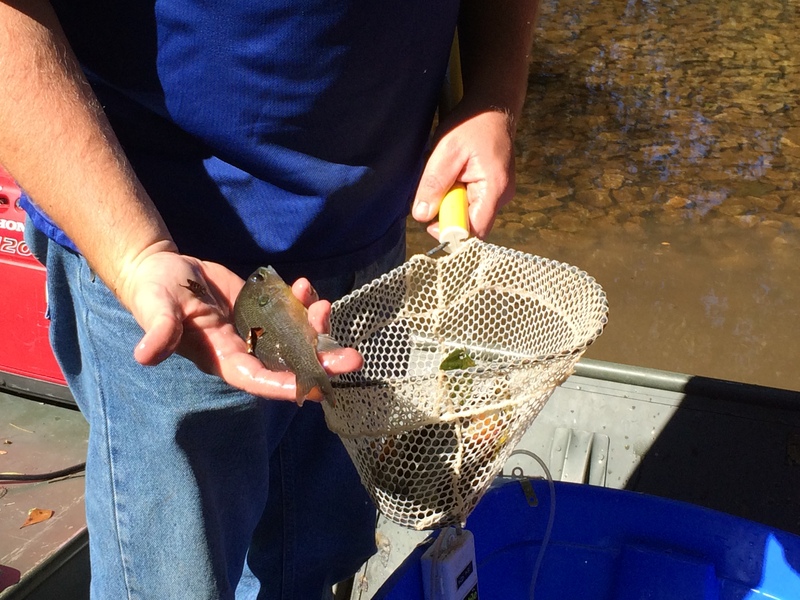 With all of this in mind, it’s clear that levels of dissolved oxygen are really important – especially to those tired fish! pH: This test measures the acidity of our water, or more specifically, the concentration of hydrogen ions. On a scale from 0 to 14, 7 is neutral. Anything above 7 is considered basic and anything below is acidic. pH measurements throughout the basin have been where we would expect them. Upstream, most measurements fall between 5.75 and 6.75, or slightly acidic. Blackwater rivers and creeks typically have acidic water due to the tannic acids that pour into these waterways from surrounding swamps as plant material breaks down. Blackwater rivers, incidentally, get their “tea-stained” coloration the same way tea gets that coloration – by the release of tannins. Our brackish and saltwater monitoring sites typically had pH readings of 7.25 to 8 which is also very typical. The types of salts found in saltwater lead to more basic water. Conductivity: It’s difficult to draw any universal conclusions from conductivity as measurements are very site-specific. Conductivity measures the water’s ability to pass an electric current and it indicates the concentration of ions in the water. Heavy rainfall tends to dilute this concentration and cause conductivity to drop. Other than that, there are not too many natural reasons for conductivity to change quickly (other than perhaps a giant flock of migratory birds hanging out somewhere upstream). Thus, conductivity is a very useful indicator for human impact as conductivity can be elevated by mining operations, agriculture (fertilizers), sewage leaks, and runoff from our streets. Generally, none of our monitoring sites experienced any kind of dramatic spike in conductivity which is a very good sign. Bacteria: Our testing specifically targets E.coli as an indicator species for the presence of pathogenic bacteria in our waterways. Currently, we only regularly test a handful of sites (and would love to expand this part of our monitoring – see below to get involved). 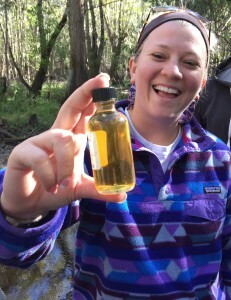 Our most recent monitoring showed bacterial readings that were well within normal and healthy ranges on Rocky Comfort Creek near Louisville, the Canoochee River at Hwy 169 near Claxton, the Ogeechee River at Dasher’s Landing, and the Casey Canal at Eisenhower Dr in Savannah. Macroinvertebrates: Or aquatic critters. We use macroinvertebrates to teach us a little history about water quality conditions. Chemical and bacterial monitoring give us a snapshot of what is happening in an instant, but macroinvertebrates can teach us about what’s been going on over the last several months since they live in the water full-time and have various degrees of pollutant sensitivity. 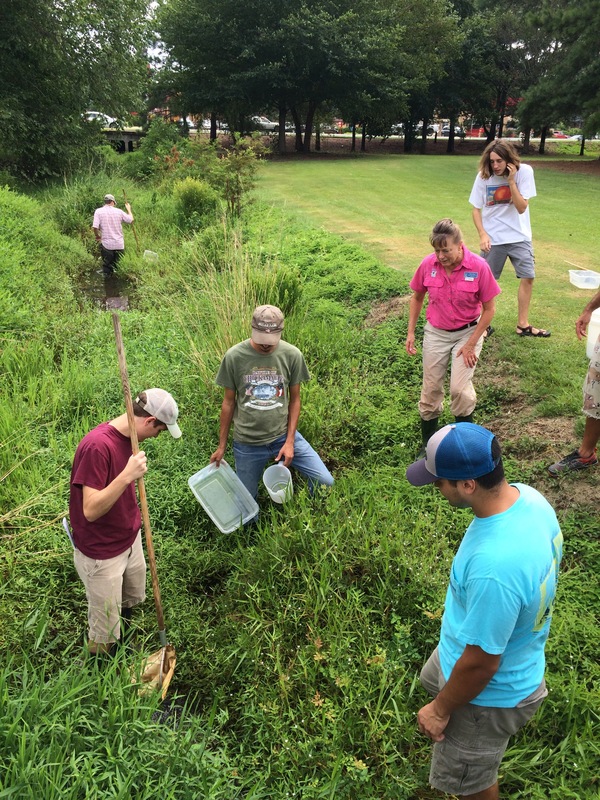 We have very few sites with macroinvertebrate data because this is the most time-consuming form of monitoring that AAS has to offer (if you want to get wet, muddy, and up-close-and-personal with some aquatic insects, see below for ways you can get more involved). We have two major monitoring sites with macroinvertebrate data that are immediately upstream and downstream from the Longleaf textile plant (formerly King America Finishing). Both sites reported Water Quality Index scores this winter in the “Fair” range which is pretty common for those sites, especially when we consider the warmer temperatures and lower oxygen levels. 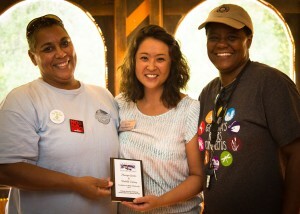 We are incredibly grateful for all of our AAS volunteers. The work that they do is vital in helping us to understand what is “normal” for our waterways and to identify when something has gone wrong. Here are just a few of the people involved in this important work. Matthew Harris, a graduate of Georgia Southern University, joined our monitoring team back in 2014. Since then, he has faithfully monitored sites near Oliver and Millen on his weekends. Matthew has also participated in and volunteered at several other ORK events including last summer when he gamely helped manage the canoes in our Canoe Tug-of-War competition in downtown Statesboro. We are incredibly grateful for Matthew’s dedication and work ethic. At last year’s Annual Meeting and Riverkeeper Awards, we recognized two of our wonderful volunteers for the Excellence in Monitoring Award, Monique Gordon and Rochelle Coatney. These wonderful ORK supporters joined our organization first by monitoring one site once a month, but quickly grew that relationship to include monitoring additional sites, helping out with clean-ups, running booths at festivals, and volunteering for practically every event that we hosted. 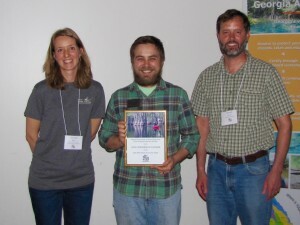 And finally, I was humbled and honored last month at the Georgia Adopt-A-Stream Conference in Buford, GA when they awarded me the 2015 New Trainer of the Year Award. During 2015, I personally doled out 186 AAS certifications during monitoring workshops and got to meet some incredible individuals along the way. 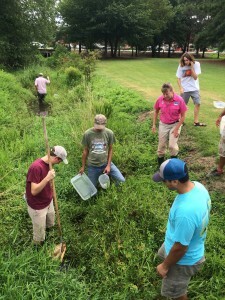 Out of all of my official duties, few have been easier to complete than my work with Adopt-A-Stream. I genuinely enjoy hosting workshops and helping people to dig a little deeper into how our waterways work. 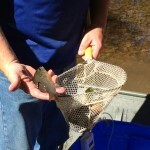 There are several ways that you can get involved with Adopt-A-Stream. Do you have free time on the weekends and do you want to join our elite group of water quality monitors? 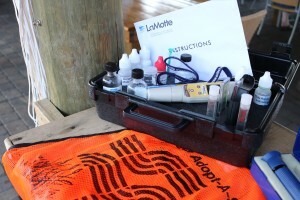 Do you already monitor a site but want to add bacterial and macroinvertebrate monitoring as well? Contact Jesse Demonbreun-Chapman at jesse@ogeecheeriverkeeper.org to express your interest in the program and learn about upcoming opportunities. We are always in need of funding for this program in order to purchase equipment and chemical reagents. To lend your support, head over to our donate page to help us keep this program going and keep our workshops free. 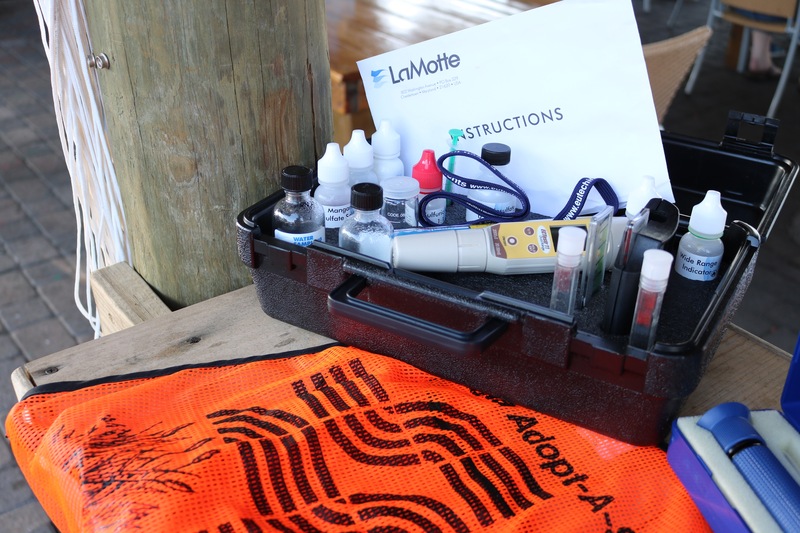 If you have a business, CONTACT US to learn how you can sponsor a chemical monitoring kit or this program as a whole.